1. Carlos Sepulveda, 2. David Bote, 3. Jared Young/Austin Upshaw, 5. Chesny Young, and 6. Trent Giambrone. What a difference a year makes. Sepulveda never played a day in 2018. Bote is now on the major-league roster while Jared Young is now the number one first baseman in the system. Austin Upshaw surprisingly struggled all year at two levels of class A. On the other hand, Chesney Young is still hanging around after having a more up year than down. However, only two of last year’s top six are on this year‘s list. 1. 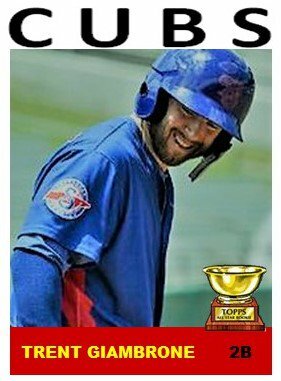 To move up from number six to number one is quite an achievement for Trent Giambrone but he earned it through plate discipline and power (17 HRS at AA). He also began branching out to play more shortstop and third base and that will increase his ability to move up in the system. He even played right field once in the AFL. Playing in the PCL should increase his HR totals over 20 next year. 2. I really really like 2018 fifth round pick Andy Weber. He is 6’2” was drafted as a second baseman but also played shortstop, third, and first at Eugene. He reminds me a lot of Jared Young but is a little bit skinnier. One thing I think he has over Young is a bit more patience. Then again, his power could change with off-season conditioning. I’m really excited to see what he can do in 2019, and also where he’s going to be to start the year. He could be a guy that could skip South Bend with his patience at the plate. 3. Last year, Carlos Sepulveda was the number one second baseman on this list. He missed all of 2018 after missing most of 2017. He’s gotten some action down in the Caribbean this winter, which is a good sign. Hopefully he can come back in 2019 as a 21-year-old, which is really strange to say after missing two years. But what Sepulveda had was the ability to put the bat on the ball. Not really a power guy, but he could turn on an inside pitch and take it right down the line. 4. When I hung out with South Bend for about 10 days last summer, one of the highlights every day was just saying hey to Christian Donahue. The non-drafted free agent out of Oregon State was enjoying every single second of playing pro ball. And not only was his attitude infectious off the field, it was infectious on the field. He played multiple positions, but mostly second. He showed the ability to hit the ball all over and to take a walk. He was one of my favorite players to watch play in person last year. He should start 2019 at Myrtle Beach. 5. When Jonathan Perlaza signed in 2015, the then 16-year-old ranked not too far behind Aramis Ademan. Injuries slowed his development, but last year saw him really come on at Mesa and I got a sneak peek of him in the playoffs at Eugene. He should be at South Bend with his solid hit tool as a left-handed bat in the middle of the infield. 6. One of the fun things about August last year was the somewhat breakout performance of Delvin Zinn in an every day role. 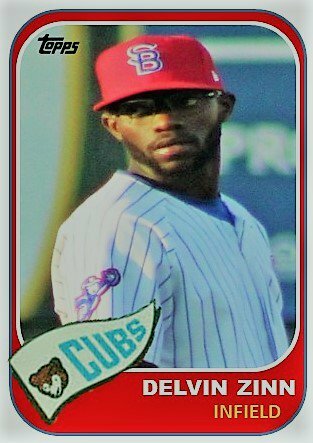 The two time Cub draftee finally got over a nagging finger injury and played almost every day throughout the infield in August as he hit .322 with a .406 OBP for the month. He’s still got some small issues on defense he’s working on. But like Donahue, he’s an infectious player to watch and to be around. Jhonny Bethencourt’s bat is one of the top young bats in the system. The issue is he has a long ways to go on defense. A wrist injury caused him to miss most of final three months of 2018. Hopefully he spends his winter working on his fielding skills as well as his decision making in game situations. I don’t see him repeating South Bend. He should be at Myrtle Beach with the quality of his bat. Reivaj Garcia hit very well for most of the season in Mesa. At 17-18 years old, he was probably playing two years above where he should’ve been. Still, the second baseman out of Mexico displayed a mature approach for such a young kid in a stateside league. Eugene will be the beneficiary of his expertise in 2019. 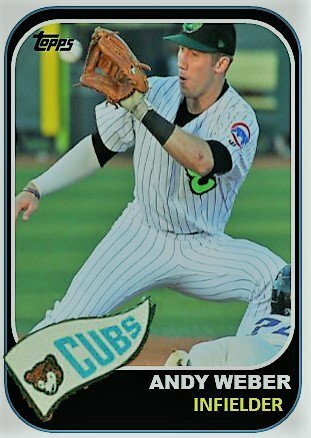 With Javy Baez at shortstop, the likely landing point for Nico Hoerner in the majors is at second base as a Cub. It’ll be interesting to see how much time he puts in there this year as he gets closer and closer to Chicago. If the Chicago Cubs moved him to second, he would easily be number one on this list. In spring training, we will see how many looks Hoerner gets with the big league club and just exactly where he plays. ‹ PreviousMiLB Mailbag – Episode IV: Did the Cubs Get Power Arms in the 2018 Draft?